Many children have difficulty with handwriting skills and brain integration. Primitive and postural reflexes have always been of interest to me especially supporting my children through school. My knowledge is much better now than when they were smaller but everyone learns somewhere. Starting at the beginning with the Palmer reflex. This is a primate reflex which emerges at about 11 weeks in utero and usually and lasts until about 4-6 months as a baby starts to focus and use hand eye coordination to reach for objects and begin exploring their world. This movement starts as a reflex and is most notable when a baby’s hand will grip whatever he touches and you need to pry their hands open. As they start reaching for items and developing their hand eye coordination the reflex is no longer needed. The development of the pincer grip for picking up smaller items which often go straight to the mouth. Using the thumb and forefinger is the forerunner for holding a pencil as well as being able to track and write from the board at school. As a baby the hand will often then go straight to the mouth developing the fine motor skill incorporating hand and mouth movements. The Babkin Response (movement of the hand which will in turn purse the lips and open the baby mouth) is also key in developing handwriting but also because the mouth is also involved so smooth speech being able to coordinate hand and mouth movements together. The early development of fine motor skills is crucial to handwriting skills , being able to shift focus from board to paper and spacial awareness and development of smooth speech. These skills can be improved with exercise and coordination skills and developing core strength as the body core does not engage fully if a child has struggled with hand eye coordination problems. Crossing the midline is great exercise for developmental skill. Helpful for visual tracking and reading and writing left to right, as well as throwing and catching a ball. Kinesiology and fine motor exercise can build strength in the intrinsic muscles of the hand to help a child to improve their fine motor skills and develop greater confidence in their handwriting ability, task inhiation and coordination. 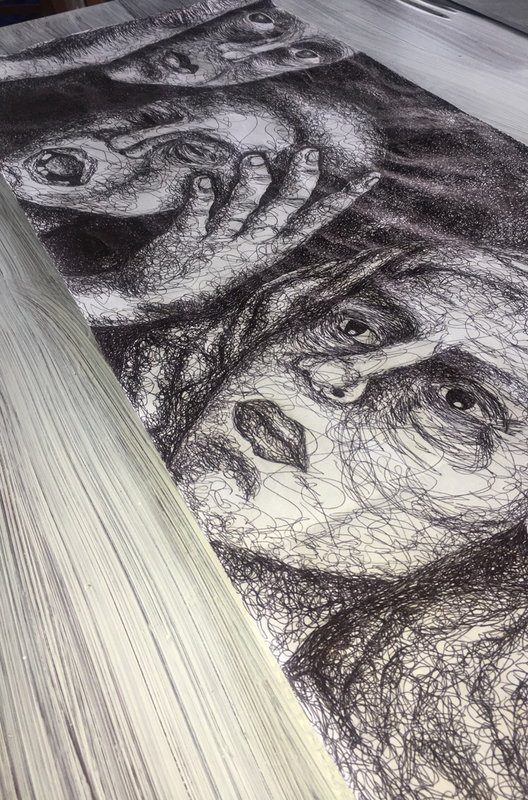 This artwork pictured is a small peak at a scribble drawing by my daughter Beth Flynn and will be on display in Mosman Youth Prize from the 16th March 2018.